It is a time of sudden wealth for a fortunate few who grub gold from the Palmer River in the harsh and unforgiving Queensland Outback. A land, where the fierce Aboriginal warriors resist the invaders in a bloody guerilla war, waged on the northern frontier of colonial Queensland. It is a time when a battle scarred and war weary Michael Duffy returns to the land of his youth. A place where he is still wanted for a murder he did not commit. 1874 is the year when old scores will be settled in blood - and a son will set out on a journey to the country of his ancestors in far away Britain. 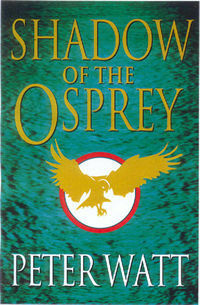 Shadow of the Osprey is also the story of a woman's struggle to consolidate a fortune in a world dominated by powerful and ruthless men. Kate O'Keefe's search for power will bring her into conflict with her feelings for the one man she has grown to love - Luke Tracy, the American prospector whose turbulent life has led him from the Californian goldfields of '49 to the Eureka stockade in '54. He is a man searching for both the elusive gold strike of his dreams and the love of a woman he can never forget. It is a story of two families bound by blood and separated by an ancient curse which reaches out to them from the shadows of a sacred place of a slaughtered people. And the evil incarnate of Captain Morrison Mort - who continues to shadow the lives of the two principal families - and all those close to them. The sequel to Cry of the Curlew takes the reader on a journey from the hellish jungles of the northern frontier to the opulence of Sydney's colonial mansions. And from the ancient, sun scorched valleys of the Palmer to the coral - reefed seas of the South Pacific. Shadow of the Osprey is a riveting adventure set against the tapestry of Australia's violent yet colourful frontier history.